Forty whales of the same species have mysteriously washed up dead on the west coast of Scotland in a month. Mystery surrounds the “largest number” of recorded deep sea whale strandings around the west coast of Scotland and Ireland. Around 58 mammals, mainly deep sea Cuvier and True Beaked whales, have been found this year – with 11 being found during one week in August alone. Experts say an unknown “deep sea event” may have happened – and this may be the catalyst for the high number of deaths. The whales are being stranded, or washed up in various states of decomposition making identification of the species difficult. But from DNA and other scientific results it is known that the majority of mammals are deep sea species that are known to be sensitive to deep sea sounds known as sonar. In Scotland, 20 whales were found beached in the Western Isles, 16 in Argyll and Bute and two in the Highlands. Twenty have stranded in Ireland. One suggestion is ‘sonar’ activity in the deep sea that leads to a phisiological change in the mammals. Marine zoologist David Ainsley who runs a whale and wildlife business in Argyll said that in the past he has seen “unusual” wildlife activity. Mr Ainsley said: “People are beginning to be aware of the impact of plastic on the marine environment, perhaps time will come when we can see the damage that sound in the sea has on marine wildlife. “Quite a few years back there was a military exercise in the area around the west coast. “Now, I can not prove there was any connection but a few days later we witnessed a Minkie whale behaving in a similar way to a porpoise. “For about a fortnight after the manouevres we didn’t see any crustaceans, and we are in the part of the world where there is the highest prevelance of porpoises, so that was fairly unusual. “Sounds in the sea have a physiological effect on mammals.The sonar echo being disturbed is similar to the eyesight of a human being taken away. Marine strandings coordinator Nick Davison, of the Scottish Marine Animal Stranding Scheme, said: “This is an unprecedented number of strandings at any one time. 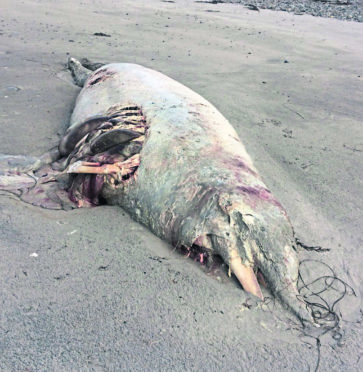 “There were increased numbers of strandings in 2008 and then in 2014/15 but not this number. “That leads us to believe that there must have been an event in the recent past that has led to a higher number of deep sea mammals dying. Scottish Marine Animal Stranding Scheme are asking for people who come across any marine animal stranded or dead on the coast around Scotland to report it to the scheme by email to strandings@smass.co.uk, log the details on the charity website at www.strandings.org or by phoning 01463 243030.